When companies and its leadership open the company door, I am sure they don’t think about being a thought leader, they just want to survive. 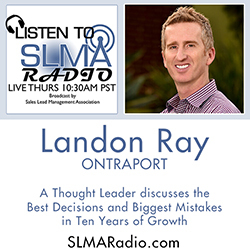 During this interview we discuss thought leadership with ONTRAPORT CEO Landon Ray. Mr. Ray, as you’ll note in his biography, spends some of his time helping others become more successful in their own small business. In this interview we’ll talk about how he and his employees made ONTRAPORT a successful company while touching on the best decisions and the biggest mistakes they made along the way. The host is Jim Obermayer.